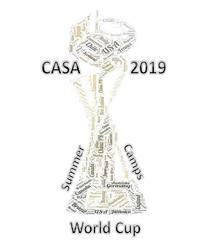 The vision of World CUP Soccer is to focus on player skill development and creating a “replica national team” environment for players to compete and learn. There is a belief around the world that when you are investing on the basic soccer skills as early as you can, as much as you can, and as often as you can, you will create players who will see soccer as a learning experience rather than a static thing. This is a five week program that is designed to help push the development of each athlete to reach their maximum potential. The first four weeks will focus on technical abilities and the speed of the game. The goal is to encourage players to become calm on the ball and to have options before they receive the ball. The last week will be games. Teams will play for the World Cup trophy by playing in group stages, round of 16, quarterfinals and the FINAL. This camp is designed for boys and girls age 7-16. The camps will be held at George/Ranger Park. All players will receive individual attention in small, skill-appropriate groups and compete in many small-sided games. Attend as many weeks as you like. Camp is held from 8:00 am - 12:00 pm. Cost is $120.00 per week with a $20 discount per sibling. The week of July 1 - 5 (July 4 - NO practice) the cost is $100. There is a discount of $10 per sibling. ©2019 Capital Area Soccer Association / SportsEngine. All Rights Reserved.